Cynthia Webb elevates the symbol of home and family to a work of personalized art. 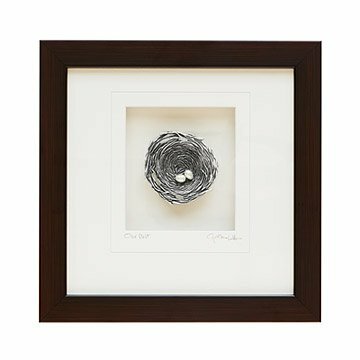 A nest is a familiar metaphor for the comforts and safety of home, but Cynthia Webb elevates that image to a work of personalized art. She casts her delicate, swirling version by hand from pewter and inside nestles a glass bead egg for each child. Presented in a shadow box frame, young couples and growing families alike will delight in hanging this keepsake among cherished photos or in the nursery. Handmade in California. "I'm inspired through the creation of art that tugs on one's heart strings,” says Cynthia Webb. Cynthia specializes in designing handcrafted pewter gifts. Her work is known for its fine detail, which is evident on all facets of her pieces. Her designs range from simple hearts to complex angels and crosses. Starting with an idea, Cynthia sketches until she is satisfied that she has captured her original thought on paper. She carves the design in jeweler's wax, which is then cast to create a mold. After the pewter is cast, the pieces are hand-finished, oxidized and polished. A thin lacquer coating is applied to prevent further oxidation. Cynthia's most popular designs capture her earliest and most enduring inspirations—home, family, faith and nature. The early influence of a creative family and the inspiration of world travel guided her to a career in the arts. Her introduction to jewelry making began in London, where she lived briefly prior to commencing studies in architecture at the University of Houston. Her work is all hand crafted in the USA. This is a made-to-order item. If you order today your item will ship no later than 5/16/2019. Even better than I expected. Love it! This art piece is so lovely. I hung it above the piano on a gallery wall in our family room. The perfect touch.